Loved the rich specifications of Micromax Canvas Spark at such a low price? Let’s find out what you get in the box with Spark, the specifications and the quick hardware tour. Note – Following content is the transcript of my YouTube video – Unboxing Canvas Spark Q380. Today we are going to unbox a snapdeal.com exclusive Android lollipop device – Micromax Canvas Spark, It is priced at just under Rs. 5000 with rich specifications, at least on the paper. We are going to test the device for in-depth performance insights, but before that, let me show you what you get with this smartphone right out of the box. The first thing you’ll see in the box is the device, which is loosely packed and placed in a cheap packaging. But let’s skip the device for a moment. First accessory in the box, white colored micro-USB to USB data connectivity and charging cable, that you can couple with the adapter. Then there is this white adapter to charge the 2000 mAh battery of Canvas Spark, that comes with LED indicator, and USB slot, which can be used to plug-in the data cable and charge the device. The next thing you get with Canvas Spark, is the in-ear headphones, something similar we have seen with the Yu Yureka. So overall, they are carrying a white color in all the accessories but everything seem to be of an average quality at the first glance. Then there are these bunch of manuals that are nicely packed with the paper ribbon. You get warranty card, and a detailed user guide, that shows all the essential information, in case someone is buying smartphone for the first time. Just like all the other Micromax smartphones, you will also find a screen protector in the box, so you will save some extra spending there. They have placed a black promotional card, to encourage downloading games, videos and music from micmicromax.com store. After the contents you get in the box, let’s move on to the device itself. Unlike the loosely packaged device, and the average quality of the accessories, the device itself has an appealing design, considering its budget pricing. The phone maintains an impressively slim profile, compared to any budget smartphone we have seen under Rs.8000. The beautiful design of the capacitive buttons is all new, and probably first of its kind in the segment. The 4.7-inch screen is covered with the considerable amount of bezel, but the device will surely attract a few eyeballs. The back side of this device has 8 Megapixel Camera, the Micromax Logo, and the speaker at the bottom. The back cover feels great to hold in hand and has a smooth rubberized finish, something similar to Moto E.
The left side of the Canvas spark has no buttons and maintains the contrast color border, which looks pleasing. On the right side, you get the volume rockers and the power button. On the bottom, you get the standard microUSB port for charging or data connectivity. And the 3.5mm audio jack is located at the top, which you can use to plug-in any of your favorite set of headphones. Under the hood, we have the battery that is covered with a warning, that says Battery is not removable with the bunch of other instructions. On the top you will see the camera hardware with LED flash, the WCDMA SIM slot, that you can use to place any 3G SIM card. And on the right side, you will find one GSM SIM slot that can only be used for 2G technology. Just above the WCDMA SIM slot, is the microUSB card slot, you can use to expand your memory upto 32GB. The device already comes with the 8GB of Internal storage, out of which 4.5GB is available for the user. 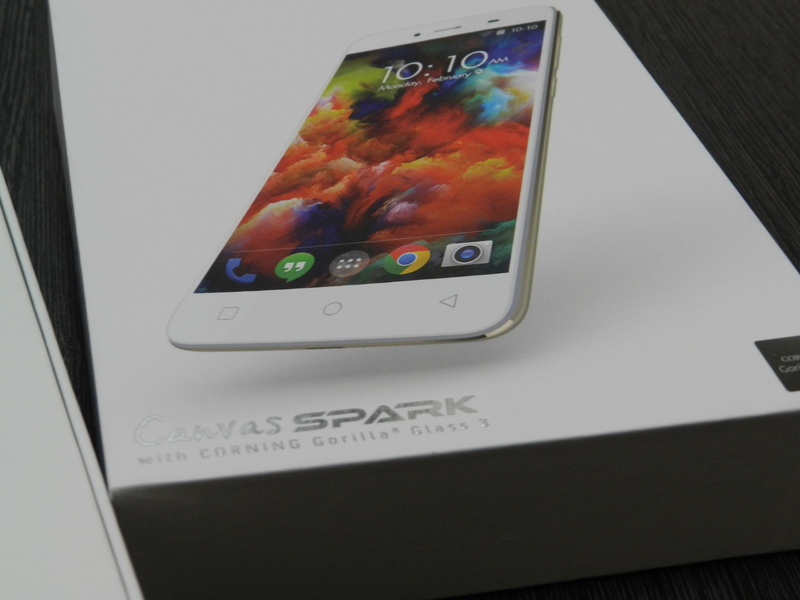 The back-cover of the Canvas Spark is too super thin, which is could be a concern if you are rough user. Not like it’s not durable, but it feels like it will bend or break quickly . I am not sure, what this plastic cover on the inside of the back cover for, but the bottom design, is adding a significant strength to the cover . Let’s face it, Canvas Spark is a one good-looking device, and probably the best looking one, under the price tag of Rs.8000. Added the lineup of next-generation specs, it becomes an even more lucrative buy with the price tag of Just Rs.4999. With the 1.3 GHz quad-core MediaTek processor, 1GB of RAM, 8MP rear and the 2MP front camera, 4.7 inch of IPS Display with scratch-resistant Gorilla glass, plethora of connectivity features and sensors, Micromax Canvas Spark is probably the most practical buy at the price range. But can the Spark survive the battle of performance against the Moto E, or the Zenfone 4 or even more devices that are currently dominating the market? Subscribe to our Youtube channel, for our upcoming review by the end of this week. And if you have find this video informative, Please like and share it with your friends!